Witch Marks (Denny Robbins) –Magical & Ritual Marks from the Middle Ages & Tudor Times. Denny Robbins gave a fascinating illustrated talk about ritual witch marks in vernacular buildings. The following is taken directly from her notes, which she kindly gave me with some additional links and illustrations. From the late medieval period there was strong belief in the damage that witches, either in human form, or through animal familiars, could bring to households. Such beliefs were particularly strong in rural populations from the mid C16th through to the mid C18th and peaked in the C17th. The first specific law against witchcraft was only introduced under Henry V111 in 1542. James 1 was pre-occupied with witchcraft and wrote a treatise about it. According to Denny, the use of such ritual protection began to be studied in the 1980’s. It should be remembered that rural populations were largely illiterate and inscribing a mark or symbol somewhere in the house enabled them to engage in a protective act. The marks are small and feint and are, therefore, very difficult see, which is why they are assumed to be for protection since they have no decorative or practical purpose. They are referred to as apotropaic or evil averting and are commonly found at points of entry in buildings such as doorways, windows and chimneys and have even been found underground. Denny described the various marks with slides: Scratched letters known as Marian symbols relating to the Virgin Mary have been found. 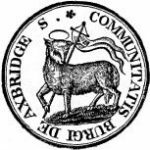 These are either conjoined V’s representing Virgo Virginum (Virgin of Virgins) which appear as W’s and also as an inverted W ie an M.
St Andrews Cross and butterfly shapes. These have often been considered before as builders marks but now have been found underground which means they can’t be. In a magical context this shape cannot be inverted or turned back on itself thereby destroying its function or even possibly creating evil. 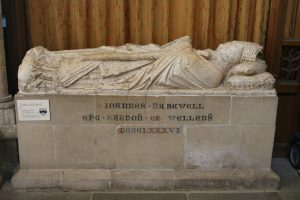 What is interesting is that the direct link with Mary must have ceased after the Reformation and it is notable that both the domestic and the ecclesiastical versions survived without being defaced. Why then did the original affiliation to the Virgin not pose a problem for the Puritans Denny asked. Another slide was of circular marks. 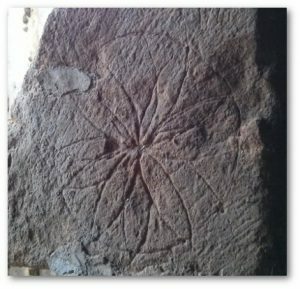 She explained that the hexafoil or daisy wheel is also frequently seen and is considered to be a reference to the sun and perhaps to the Virgin Mary. It has been found as part of the decoration at Housestead Roman Fort at Hadrian’s Wall. As few rural vernacular buildings pre-date the C15th there is no way to establish its use until that time although, by the C11th it was a feature of church decoration associated with fonts and baptisms. The shape is usually incomplete and therefore imperfect which might, she suggested, be a gesture of respect for the deity who could, of course, create perfection. It is seen as a protection against evil and as a good luck symbol and is often found in food preparation areas. 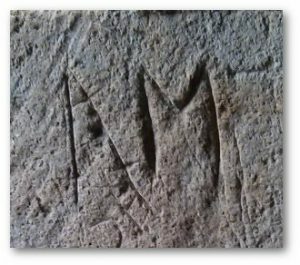 Another slide showed a hand and a letter M found at the Church of Holy Rood in Ampney Crucis. As well as ritual marks there are sometimes ritual deposits found in middens. 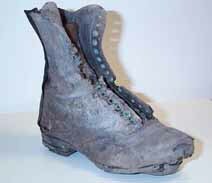 These have been found in animal housing and under threshing floors and are also found in America and Australia and, as such, are thought to be part of the cultural baggage of convicts and settlers. She suggested that there are also C19th middens containing hand-written notes, letters, trade receipts etc. which may have marked a significant period in the life of the occupants of the house. 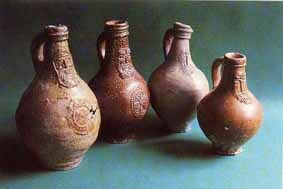 Bellarmines or witch bottles which stem from the C16th and C17th. have been found beneath hearths and beneath walls and floors, Those considered to be “true” Bellarmines are pot-bellied bottles of stone-ware with a mask depicted on them but later ones were also made of glass. The contents (hair, the magical metal iron in the form of iron pins or nails, urine and sometimes fabric ) all appear to constitute some form of a spell. One was found at Hymerford House in East Coker which dates from the C15th and was discovered at the threshold of the house. An article in the Times from 2005 recorded the finding of a glass witch bottle containing foul smelling contents at a National Trust site in Dorset buried in a stone wall. 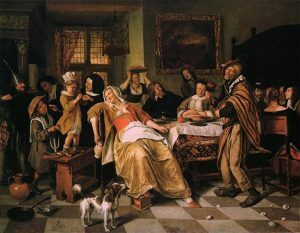 It is believed to have been placed there in the C18th during an outbreak of foot and mouth disease and parish records confirm that there was an outbreak of “distemper” during the 1700’s. 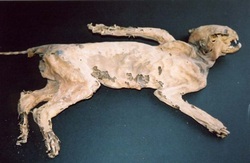 Dead cats have also been found in roof spaces, under floors, between lath and plaster panels and in sealed cavities. Several of these had their legs bound, some were artificially posed in aggressive postures and some were accompanied by rats. According to Denny these were probably placed as foundation scarers or vermin scarers and by 2004, 100 such finds had been recorded in England and 50 in Germany. Horse skulls have also been found. Candle marks: the majority of these are found in principal bedrooms or in servants quarters in attics and rarely in ground floor room and so are assumed to be sleep-related. As Denny pointed out, any noise in walls or ceilings above the bedrooms might have been interpreted as a witch’s familiar having entered the house. These finds are rare and confined to high status houses in the East of England. Denny then showed slides of ethereal marks, which have been drawn with carbon from candle flames. These include symbols and letters and sometimes even names. She described a house near Bury St Edmunds, which has an almost completely marked ceiling over the kitchen chamber which contains the name Sarah Sugate. Records show that a Sugate family was living in the house during the second half of the C17th and the owners of the house, Robert and Mary Sugate, had a daughter Sarah. Sarah left the house on her marriage and so there is no knowing what had happened in the room to cause anxiety in the room. Denny postulated that perhaps she was given to sleep walking and would go through that room when she did so. In the C17th sleepwalkers were often thought to be possessed – could this be why there the marks are there she asked? Gridiron marks have also been found and Denny explained that the gridiron was occasionally used to make “music.” She showed a slide of a painting by the Dutch painter Jan Steen in which a form of rough, rhythmic music is being played on a variety of instruments including a gridiron. Such music was intended to drive away sprits and witches. In the illustration (left) the man “playing” the gridiron is on the left with a funnel on his head. Burn Marks. For a long time such marks were thought to have ben made accidentally, but it is now believed that they were made deliberately as some form of “inoculation” against fire and were placed on strategic timbers during construction. They appear to start in the late C16th and decline in the C18th and seem to be confined to northern Europe. Denny suggested that, as this is where and when, the Protestant Reformation took place, the burn marks may, in part, be a response to the loss of magic (both Christian and secular) which were suppressed by the Reformation. Single marks are also seen and these are in low visibility locations especially on roof structures and may be the ones most likely to be apotropaic. Single marks in high visibility locations are thought to be discrete blessings and are often found on moveable objects such as beds. The reason that these are regarded as having been made deliberately is that they are all between 3 and 6cm in depth and taper in shape and are usually seen at the shoulder height of a person when standing or kneeling. Burn marks have also been found associated with other symbols and marks – there are examples in Europe of burn marks and horse-shoes being positioned over house entrances and some have been found close to Marian symbols. It was a very interesting talk and so inspiring that a few people went home and were later seen prowling about their houses with torches searching for marks! Fortunately no-one thought they were burglars and called the police!! Brian Hoggard, ‘The archaeology of counter-witchcraft and popular magic’, in Owen Davies & Willem de Blecourt, Beyond the Witch-Trials, 2004, Manchester University Press, pp167-186. Ralph Merrifield, ‘A Charm Against Witchcraft’, Country Life, June 23rd 1955, pp1612-3.